Simple prime numbers, due to their patterns of reoccurence, sometimes lead to interesting studies. The number six (6) and eight (8) or rather the patterns that exit as 6 of or 8 of can be surprising. It is easy to say, but complex to demonstrate that here is a numerical basis and coupling effects and hierarchies resulting underlying either Kaos, Bios, Languages, and all else that exists or that 'humans' have thought about. The theory-stories about creation, diversification, collapse-fini ...all are told by numbers. Match the numbers correctly and learn why the great wheel of the universe turns. These topics have already been reviewed comparing pre-bible-source epics to chinese concepts and language symbols. An amusing part of 'martial' exercise is that martial is not an exercise; it is overcoming your need to survive and your misgivings about killing. There is no 'brotherhood' of 'warriors'... 'war does not make one great', it makes dead. It is also not an exercise, it is a self-instruction about your inner-structure. The Chinese exercises names are many, virtually all of the so-called 'inner'-source exercises follow the same teaching idea : unify-join, be 'one' with a greather 'uni-verse', or empty and join-return to a proto-source 'verse' Way; by the method of zen-[non] mindedness. 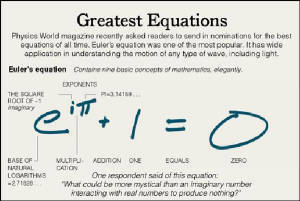 Find the multitude of all in the one., the zero. It would be simplistic to say that the idea-pattern series is 0-1-2-3-4...6...8 and so on; or that practice is simply the rejoining of 8-to-6, to then 4, to the three-way trinary union of 2, to get to unity, one, and then to 'nothing' zero. Each of the so-called inner exercises developed and named by the chinese can be shown to each play this numerological puzzle encoded in their names. Partly, due to chinese reasoning, has to do with geometric-symbolism and cosmic-numerology. The chinese 'universal' view was terrestrial-sky based: the earth was 'square'-4-sided while heaven-sky above was circular-round, 'perfect'. The inter-communion-support between them was explained as a doubling to the 8-posts, a mathematical convenience. However, esoteric application of this theory, led to an 8-fold immulation of heavens' circle. Liu He Ba Fa : 六合八法拳 the 6x8 encoding. The idea of groups of numbers is a simplistic method to view and to codify-remember either cosmos, world, or a collective knowledge; convenient, but unrealistic. Nothing, zero, yields unity,...one, which divided, yielding two, ...divided again yields four, from which [in both the chinese mind and its ideopictograms], yields the numbers six and eight; 6 and 8 are each just adaptations from and joined to the number 4. 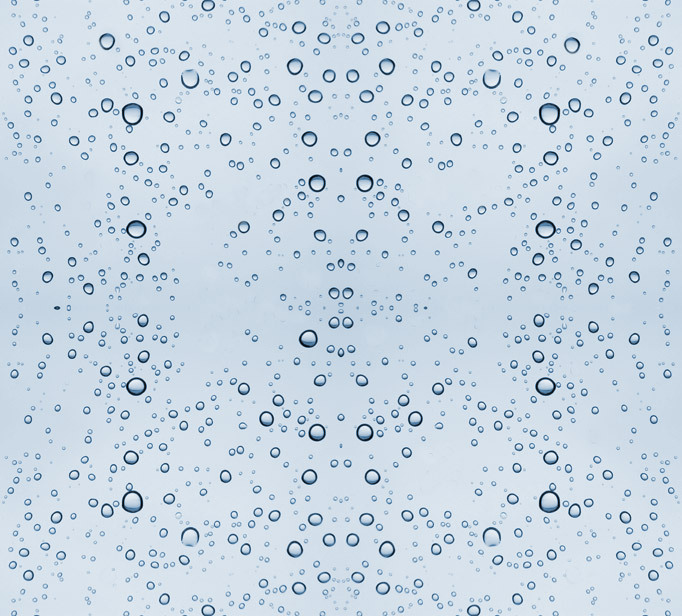 Reality may 'appear' this simple, but often, it is not; even if a connection found. The mind of man is not the 'mind' of the universe. To the Chinese, six collects: 6-adverse influences: ie. the environment, weather, and temperature; 6-internals of exercise kinesthetics. 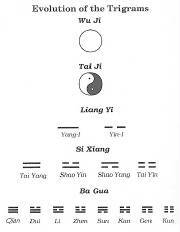 To the Chinese, eight collects: 8-beneficial remedies, 8-buddhist principles, 8-symbolic joining and separations: bagua. Tai-Chi : 太極拳 the Extreme-limit, center-balanced 'post' of 'heaven+earth', the universe; the pole-position around which the seen photonic parts of the 'uni'-verse rotate and spin. Being 'central' and supportive to everything, it represents highest-extreme-limit. Tai-Chi is an epicenter and axis-center : being in the middle, it is both origin and around which other methods must orbit, traverse, or spin. 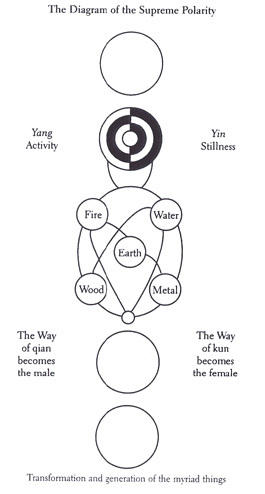 Tai-Chi theory begins in ancient chinese thoughts about numerology and cosmology; even though later corrupted to shaman's use, the simiple couplings of binary/triplex concepts was carried with/into the 8-patterns of pa-kua. The principles can be found in the exercises said of Xu Xuan-ping of the Tang Dynasty; many others however go with the erroneous story that Chang San-feng in 1400's formulated them even though there exists no bonefide records of his existence; there exists scholarly studies of this. 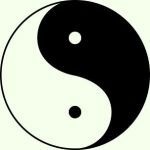 It is known that taoist turned neo-confucian Zhu Xi [1130-1200] enpictured the Tai-Chi symbolically as the circulating interwoven orbs, yin/ yang; this symmetry concept also goes back to earlier conceptualisations. At Hua Shan, a pior version using the water and fire trigrams within a circle are used; they are engraved there in stone. This is the first symbolic representation known thus far; the swimming fish icon of Zhu Xi came later. [ Note: the application of the cosmological patterns to a martial exercise to be called Tai Chi-boxing 太極拳..was not of archaic usage, but modern; when the senior member of the Yang Family demonstrated it for the Manchu [per their order] it was remarked that 'it seemed like the tai-chi 太極 motions'. Thus it is erroneous to to discuss this naming backwards historically..and only somewhat as a principle. Ba-Gua : 八卦 - the multi-fold patterns turn around the center, divide and join ..in a dual-triplet appearance; the planets and stars of the universe, rotate or spin; the ether of the cosmos itself, does not. The illuminated 'stuff' we can see, is less than 4%. The relation of binary to trinary symbolic-numerology is credited to the mythic Fu Xi; the interpretation of their 'meaning' is entangled in the unclear general elborations of the Change Classic, the Yi-ching, which appeared later and is as much to ideas of neo-confucians as to neo-taoist. Ba-Gua is the pericenter, it orbits and/ or spins and/ or crosses back and forth around the center, the tai-chi; as an idiotic-idiom, it could be said that ba-gua runs circles around the tai-chi competition. In truth, they are interlinked and is is more likely that where part of a joined teaching [ suggested as a basic and an advanced set of wutang circuling exercises ]. Xingyi is Form-of-the-mind, xinyi is Heart-center-feelings with Minds'-awareness, innermost-Intuitive-response; the first is form-originating, the later is intuition-responding; the xinyi-principles are basic to the mind-intent or original-intent concept of yiquan, LHBF, waterstyle, and wunyun- or qi-aikido. All of these titles/ names are joined and are similar, each view is deeper, none is whole correct. All chinese martial arts play somewhat with numbers; if the core aspects can be embraced by just two (2) movements, why are 108-form movements preformed; of if 66 plus 2 more form movements are needed, 66-for the core forms, and two (2) more for the beginning and ending, which are usually not named, why the deception? Note below that a reference is usually made to x2 or to x8 in this numerology. Chinese in many ways; it also does show up in science. Note that a reference is usually made to either x2 or to x8 in this numerology. The number 8 is = 2 x 4 or 2 x [2 + 2]; 2 being a prime number. Aikido=HeQiDao: Harmony of Qi-flow with the flow of the 'Way' of Nature; the spirit is expressed and the qi is inspired to join. The name and concept of aiki-do are said similarly as he-ba 'harmony' by 'methods', when the liu-he, the six-harmonies are one, it flows united, he-qi or he-shen 'harmonious-spirit'. How this is done or to what standard? Other schools say blah-blah-chuan, by boxing; blah-blah-chuang, but palm-change-waving, blah-blah-dao, by understanding 'fate' and making a fortunate-way, a dao. The counter-parrallel concept entering here is, you can conform to the situ-nature of your environ-universe as it is...will be...or ...as it was, yuan 'original'. This concept of get back to basics, original, by change, by turning things around is useful, but dangerously misleading due to its' simplicity also. The earlier Sung Dynasty water-fire trigram inner-alchemy symbol inscribed at the base of Mt.Hua in Shensi Province predates the later yin-yang spiral-orbit symbol ascribed to a Neo-confucian scholar Zhu Xi [1130-1200]. The differences are more than just image-symbolic, their symbolic-content and subject-intent widely differs. The early water/fire symbol gives a chemical methodology; the swirling spiral reversal of the tai-ji-tu informs that to reverse direction, you need to transform [hua] by turning thing over and around [hui], to switchback.